New documents released by the FBI have many Republicans calling for further investigation into Hillary Clinton's emails. The Supreme Court is already short one justice because Republicans refuse to consider President Obama's nominee. Two sitting judges are in their 80s, so additional vacancies are likely. 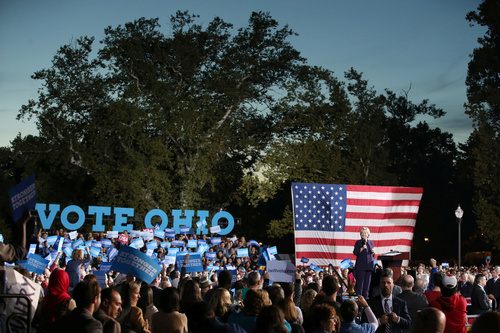 Despite recent talk that the election is rigged against the GOP presidential candidate, Edward Foley of Ohio State University's Moritz College of Law says that is "extraordinarily unlikely." In the battle for control of the Minnesota House, a few seats in Southeastern Minnesota loom large. They include a Republican trying to make a comeback in Rochester, and the House tax committee chair defending his seat. Melania Trump on Monday dismissed her husband's sexually aggressive language as "boy talk," insisting his remarks do not reflect "the man I know," and said she does not believe that he has assaulted any women. In a wide-ranging interview, the vice president talked with NPR's Robert Siegel about Donald Trump's recent threats to jail Hillary Clinton, talk of a "rigged" election and more. "Violence has no place in our society -- but especially in our elections," Gov. Pat McCrory said. His response comes in the wake of an apparent arson attack on GOP headquarters in Orange County. The Democratic governor's remarks this week renewed calls to address rising costs in the individual market. Here's a look at the issues at play and the ideas to fix them. Donald Trump is lashing out at Republicans who have tried to tone down his rhetoric about election fraud. They're both foundations, and they've both become political liabilities for the major presidential candidates. But beyond that, the Clinton and Trump foundations have remarkably little in common. WASHINGTON (AP) — Donald Trump is calling Republican leaders "naive" for dismissing his claims of a rigged election and urging his supporters to "come together and win this election." His comments came in a series of tweets Monday. There is no evidence voter fraud is a widespread problem in the United States. House Speaker Paul Ryan says he is confident the election will be conducted with integrity. On Sunday, Trump's running mate, Mike Pence said Trump's claims of a rigged election refer to media bias. Trump tweeted on Monday: "Of course there is large scale voter fraud happening on and before election day. Why do Republican leaders deny what is going on? So naive!" The Republican chair of the House Oversight committee said just-released FBI files show allegations of a "quid pro quo" between the FBI and State Department. The FBI flatly denies the allegations. Donald Trump has been talking of a "rigged election" as his running mate and other GOP leaders speak more cautiously about the electoral process. Minor party and write-in candidates are hoping to take advantage of voter dissatisfaction and say they represent a guilt-free option for people who are looking for something different. WikiLeaks has released what it claims to be transcripts of three paid, closed-door "speeches" Hillary Clinton gave to Goldman Sachs. There are deep emotions in the African-American community behind this election's lopsided poll numbers: dissatisfaction, nostalgia, and even disgust. Here are five things you can do to make sure you can cast your ballot as smoothly as possible on or before Election Day. At a campaign rally in North Carolina on Friday, Trump sought to discredit his accusers. 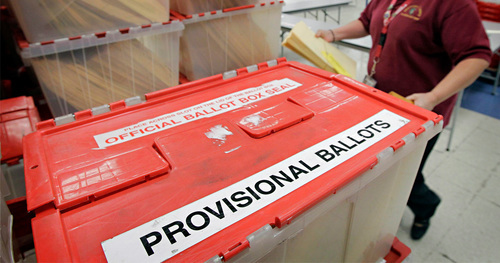 Provisional ballots, meant to ensure every voter gets access to the ballot, are often tossed out. DFL Gov. Mark Dayton isn't on the ballot this year, but he's spending a lot of time on the campaign trail trying to help fellow Democrats get elected to the Legislature. As the presidential election draws to a close, Obama has increasingly embraced his role as troll-in-chief to the former reality star who hopes to succeed him in the Oval Office. Emails released by WikiLeaks reveal at the height of Hillary Clinton's email controversy, her top campaign aides drafted a video address to supporters that the candidate never delivered. Speaking in Florida Thursday, Trump also criticized People writer Natasha Stoynoff's looks, arguing that he wouldn't have made a move on her. The first lady gave a rousing, lengthy speech Thursday hammering Donald Trump for vulgar comments he has made about women. A federal judge ordered Wisconsin transportation officials Thursday to immediately produce documents clearly explaining how people who lack a photo ID can obtain voting credentials. Rocked by sexual assault allegations, Donald Trump is saying that that his campaign is "an existential threat" to the political establishment. Trump made his comments at a rally Thursday in West Palm Beach, Florida. It was his first appearance since several women stepped forward to say they had been groped and received unwanted advances from Trump. The Republican nominee said "the political establishment'" is trying to stop us and said that "for the media, nothing is out of bounds." Trump said Thursday at a rally in Florida that he has evidence to disprove allegations of sexual assault and will release it at the "appropriate time." Several women have come forward in a series of reports claiming that Trump groped or kissed them without their consent and made unwanted advances. Trump said the claims "are totally and absolutely false." He called them "pure fiction and outright lies." Donald Trump has dodged reporter's question as to whether he has ever touched or kissed a woman without her consent. Trump met with local business leaders Thursday before a rally in West Palm Beach, Florida. The rally comes amid a series of reports about women who claim Trump had groped them and made other unwanted sexual advances. Trump did not answer the question as the roundtable attendees booed. Trump then turned to the room and declared "what a sleazebag." Michelle Obama said she "was shaken to the core" by comments that GOP Republican nominee Donald Trump made in which he is heard on a 2005 tape bragging about how his fame allowed him to "do anything" to women. First lady Michelle Obama says Donald Trump's crude sexual comments about women should not be seen as "politics as usual." Mrs. Obama was speaking at a Hillary Clinton rally in New Hampshire. She called the Republican presidential nominee's language disgraceful and intolerable. She said that it should outrage all, regardless of political affiliation. She said he was bragging about sexually assaulting women. Mrs. Obama was referring to a 2005 video in which Trump is heard bragging about how his fame allowed him to "do anything" to women. He later dismissed his language as "locker room talk." There's unprecedented uncertainty about how conservative Utah will vote in the November election. That's because the usual cohesion of voters in the Republican stronghold has been blown up by Donald Trump's crudeness and volatility. Utah is a must-win state for Trump, and he may end up squeaking out a victory. But the state's widespread aversion to the brash billionaire has soared following the release of a recording of Trump degrading women. An increasing number of Utah's mostly Mormon voters are considering going with third-party candidates Evan McMullin and Gary Johnson. It could mean an improbable Utah victory for Democrat Hillary Clinton if she captures just one-third of the state's votes. That's a level achieved several times in past three decades by Democratic candidates. Tim Kaine says Hillary Clinton's marriage is "not an issue for the voters," despite Donald Trump's efforts to highlight Bill Clinton's misconduct. The Democratic vice presidential nominee is reacting to the campaign's new focus on both candidates' treatment of women. He was appearing Thursday on ABC's "The View." Trump has been talking aboutBill Clinton's affairs and making unproven charges of sexual assault. Kaine said the latest allegations from several women who said Trump touched or kissed them without permission are "shocking." Kaine is also playing down the latest batch of hacked emails of Clinton campaign staffers. He says you "can't automatically assume" the hacked emails are real. It's impossible to authenticate each hacked email published by Wikileaks, but Democrats have not pointed to specific cases in which emails were altered. Donald Trump is trying to discredit new allegations of groping and sexual assault. The Republican nominee says on Twitter that a New York Times story on two women who allege he groped them years ago is "phony" and a "total fabrication." Trump is also going after a People Magazine writer who alleges Trump pinned her against a wall and kissed her without consent in 2005 as she was interviewing him for a wedding anniversary story. He tweeted: "Why didn't the writer of the twelve year old article in People Magazine mention the "incident" in her story. Because it did not happen! The writer says she didn't publicize the incident at the time because she was ashamed, afraid of the repercussions and blamed herself for what she says happened. The soap opera actress in the video that has rocked the presidential campaign says Donald Trump's comments were offensive. But actress Arianne Zucker says she wasn't shocked by it, given "that type of personality." She says that's "probably why it doesn't mean a lot to me." Zucker spoke in an interview broadcast Thursday on NBC's "Today." Zucker is the actress who meets Trump and TV personality Billy Bush on a soap opera set in the 2005 video. In the video, Trump boasts of using his fame to kiss and grab women. Trump, before greeting Zucker, tells Bush he needs to use Tic Tacs in case he starts kissing her. Trump has said he regrets the remarks, which he describes as "locker room" banter. Zucker describes that as "an interesting apology." America's campaign for president is quickly devolving into an ugly fight over who has treated women worse: Donald Trump, whose White House bid is floundering, or Bill Clinton, who isn't on the ballot. Trump's campaign is now openly signaling it will spend the election's final month re-litigatingBill Clinton's marital affairs and unproven charges of sexual assault, as well as his wife and Democratic nominee Hillary Clinton's unverified role in intimidating the women who were involved. But Trump is a deeply imperfect messenger: his attacks on the Clintons' treatment of women are being overshadowed by a flood of allegations that he kissed and groped women without their consent. 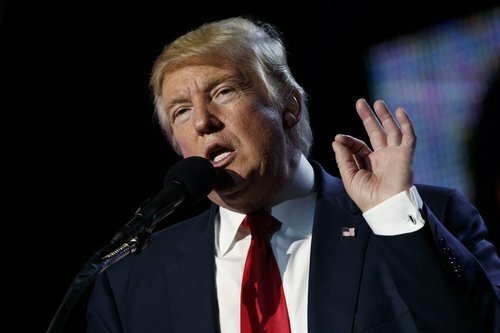 The New York Times and the Palm Beach Post reported stories about three women who alleged Trump had inappropriately touched them. Trump's campaign is now signaling it will relitigate Bill Clinton's marital affairs and unproven charges of sexual assault, as well as what Trump says is Hillary Clinton's role in intimidating the women involved. WikiLeaks is meting out a trove of hacked emails from Clinton campaign chairman John Podesta. The latest release includes commentary on Catholicism and risotto. America is at a demographic inflection point, posing challenges for both Democrats and Republicans this election season. Two women tell The New York Times that Donald Trump touched them inappropriately -- groping a woman in one instance and kissing a woman in another -- during separate encounters that took place as long as three decades ago. Donald Trump says if he loses the presidential election, it will have been the biggest waste of time and money in his life. Also, he doesn't know what comes next for him. The Republican presidential candidate told supporters in Ocala, Florida Wednesday: "If we don't win this election, I don't know what I'm going to do." Trump is struggling to steady his flagging campaign after a recording of him degrading women sent it reeling. He's seeking to re-frame the competition as a referendum on Democrat Hillary Clinton's fitness for office in light of revelations included in documents released by Wikileaks. The GOP nominee reacted to a questioner who said she's Muslim by saying Muslims have to "come in and report when they see something going on." Muslims on The Internet responded with comedy. 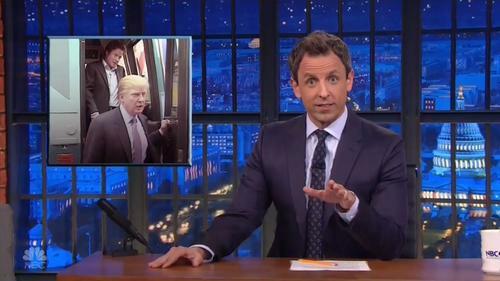 The best of last night's late-night TV: Donald Trump's tweet storm. PBS NewsHourHere’s a breakdown of the trend lines as they stand now in mid-October, according to a broad range of polls. Follow these states closely for the next four weeks, and you’ll have a good sense of where the election is headed.